‘Light Shape’ by Fiandre are a range of designer bathroom lights. Made out of bathroom wall tiles, they integrate wall tiles and lighting. 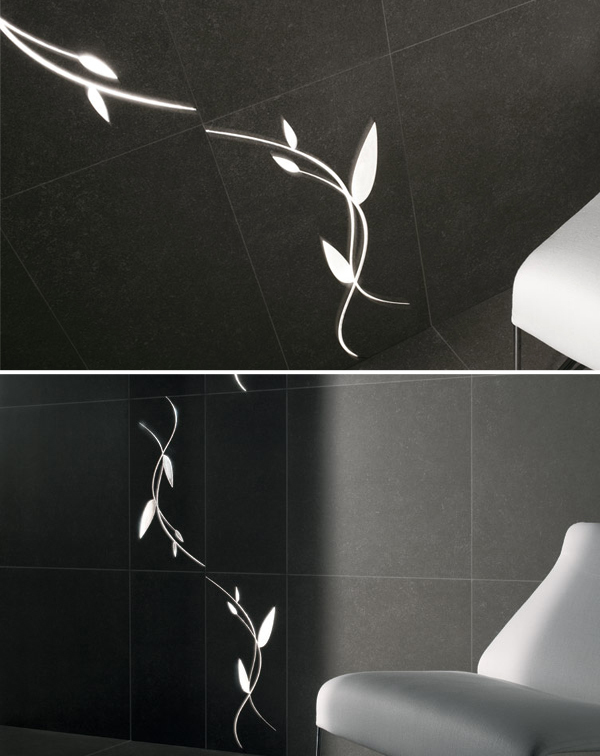 Floral designs are cut out of the tiles allowing for embedded lights to shine through. A new concept to bathroom light fixtures, these bathroom wall lights provide elegant and luxurious ambient lighting for a bathroom without taking up any additional space. 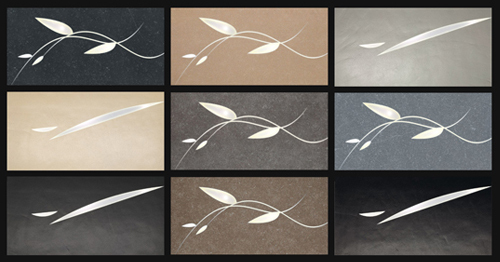 These 24”x12” porcelain tiles come in a number of floral designs so that you can build your own bathroom lighting/tile design. The tiles themselves come in a range of 9 different colors and finishes, allowing any interior designer to fit them into their décor style: from contemporary graphite black tiles, to a Mediterranean sand color. 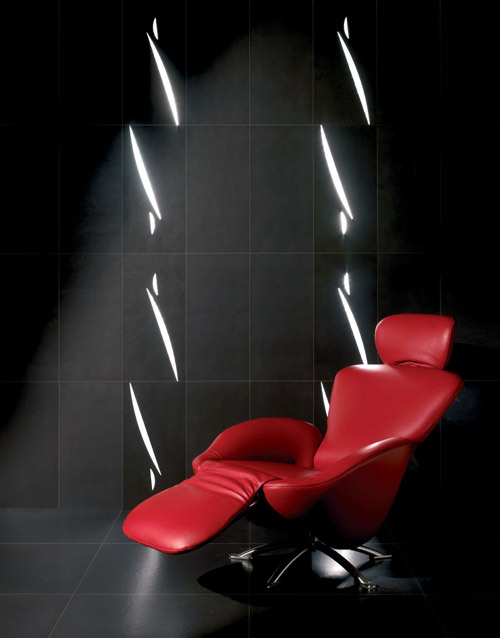 Fiandre is an Italian high end floor and wall tile company. A global company with dealers and shops all across the world, from America, Ireland, London, to Dubai, China and Singapore, plus many more locations. 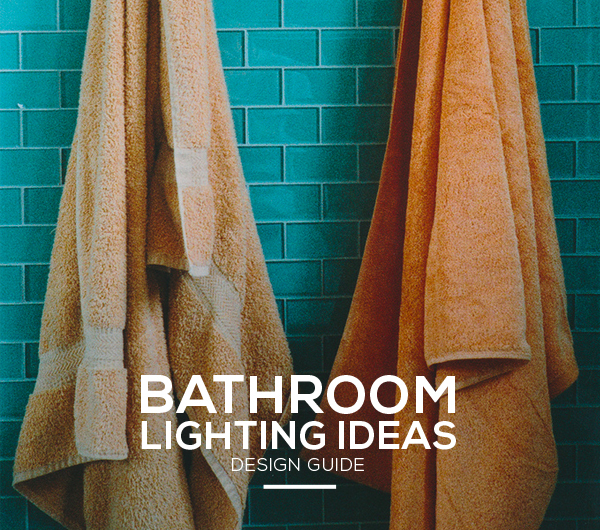 For more design inspiration have a look at our guide on 9 Bathroom Lighting Ideas. With the right placement, cheap lighting ideas can bring sophistication and a warm ambiance into any room. The right light can bring out the best in any room and can provide the exact atmosphere and ambiance that fits a particular space. However, these lighting fixtures need not break the bank. There are affordable options that provide the right light and are energy efficient at the same time. There are more options for inexpensive indoor lighting since there are different lightning needs of specific parts of the house such as the kitchen, the living room, or the bedroom. The most important thing to keep in mind when providing lighting in various rooms, is looking for the optimal placement to get the most illumination in the room without using excessive lamps and bulbs. However, it is also important to consider the ambiance that one wants to achieve in the room. For example, kitchens need to be well lit so that cooking can be done with the best possible light. The living room can be lighted by conventional bulbs wrapped in colored transparent paper to give the desired color for the room. This is a fun tip when preparing the room for a Christmas party or some other gathering where a change in the lighting of the room can help set the mood. Compact fluorescent bulbs produce a warm, soft glow that will be perfect for bedrooms and living rooms that need warm and soft illumination. They are also more energy efficient compared to incandescent bulbs and last ten times longer, making them one of the most affordable options for indoor and cheap kitchen lighting. These are also great for cheap bathroom lighting. There are nifty and unconventional ways to light up the bedroom or the living room to get that ambiance that works to make living rooms and bedrooms cozy and relaxing. Candles are the traditional way of adding an instant glow to any room but they can be dangerous, high maintainable and costly. 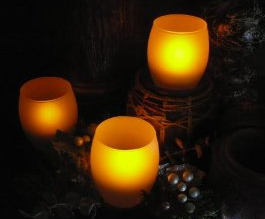 A cheap alternative is eternity flameless candles. 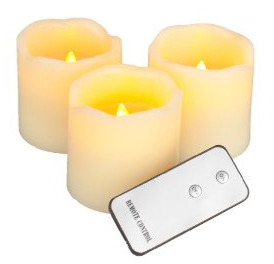 These led candles which look like real candles but are powered by small coin batteries. 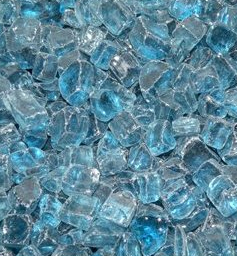 They do not melt, so there is not clean-up of molten wax required after every use. 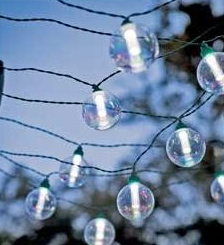 There are various ways to illuminate the outdoors on a budget. Solar lighting, the use of reflector lamps, and the use of standard incandescent bulbs are great cheap outdoor lighting options. Solar lighting can be achieved using solar panels, or the more common battery powered light fixtures. Panels are a more complex option but can be bought from hardware stores and even online and they are very easy to maintain. 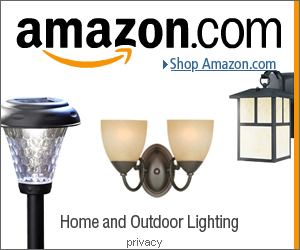 Outdoor solar lighting can easily be bought online at such places as Amazon. There is a whole range of outdoor solar lighting, from decorative outdoor sting lights, outdoor lanterns, tiki torches, to recessed deck lighting. The only disadvantage to using solar lighting is that there may not be enough stored energy during overcast days so the bulb may not be as bright compared to conventional lighting. The light given by solar power can be used as a warm accent to the backyard for short evening parties or barbecues. Reflector lamps are great alternative of cheap lighting fixtures to solar lamps. These are designed to disperse light beams over a large area, making it perfect light sources for patios and backyards. Bulbs for these lamps are also inexpensive and they offer great color rendition. Another cheap option is low-pressure sodium lighting. This is one of the cheapest types of lighting because it is very energy efficient. Up to 90 percent more efficient than the standard incandescent bulbs, this is suited for outdoor lighting since it can stay on for several hours before heating up. There are various ways to light a room or a space up using these cheap lighting ideas. Compact fluorescent lamps, solar lights, and other unconventional lighting fixtures can help illuminate the room without costing a fortune. Knowing the right kind of lights and where to place them can help homeowners take advantage of the space they have and the lighting options available to them in order to set the mood of the room without breaking the bank. There is nothing quite as intriguing and cozy as a blazing fire, both indoors and out. Everyone loves them and the glowing ambiance they create, but they can be expensive, messy and even dangerous. Fireplaces and wood stoves have to be cleaned constantly and the soot they generate can leave a layer of dirt over everything in the room. It is little wonder that a clean, beautiful and superior alternative is taking the country by storm. 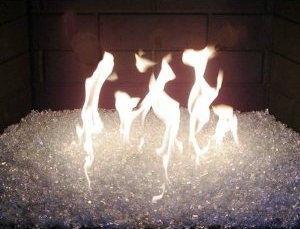 One of the hottest luxury trends for fireplaces and fire pits – beautiful reflective fire glass has everyone buzzing. What Is A Fire Glass Fireplace? Replacing old wooden logs, beautiful tempered glass has changed the look and feel of home fires. The wide variety of size options and colors lets anyone create a unique and customized look for their home, indoors or out. Cleaner, safer, and more practical than old-fashioned style logs, fire glass rocks are available in both beads and small pieces of tempered glass for use in fireplaces and fire glass pits. They are vibrant, reflective and colorful, adding a whole new dimension to any ordinary fire space. Tempered glass is specially treated, tumbled and polished for safe use as fire glass. It will tolerate high temperatures easily, without discoloration or producing the smoke, ash, toxic fumes or dirty soot that traditional wood fires generate. Clean burning and environmentally friendly, fire glass is an elegant and luxurious focal point for a living room. 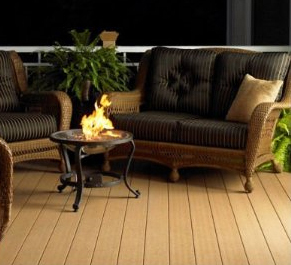 Available in a multitude of sparkling colors such as crystal blue, evergreen, champagne, copper, bronze, jet black, teal and gold, reflective fire glass creates a mesmerizing focal point in any room, on a deck or patio. The use of fire glass conserves fuel energy such as wood and charcoal all of which produce toxic smoke that pollutes the air. Prized for its durability, safety and beauty, fire glass keeps the environment pollution free while providing the most dazzling and decorative fires available. Used in a direct vent fireplace, many people use a contrasting colorful backdrop for the back of the fireplace, creating vibrant effects that give new life to any fire. Fire glass can be used with both natural gas and propane for unparalleled convenience and versatility. 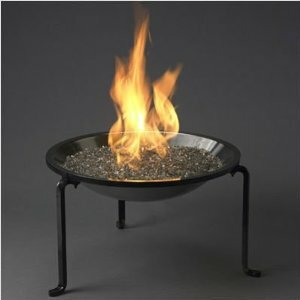 With no added expense to replace an orifice, you can adapt your existing fire space to a fire glass fire pit instantly. Fire glass will radiate several times more heat than wood or artificial logs when used with a burner pan. Because there is nothing to block the heat radiated by the flame and hot glass, you will have more warmth than typical gas logs are able to produce. Perhaps just as important, fire glass is far more attractive to the eye than gas pipes and artificial logs could ever be. Designed to be used in fire glass fireplaces, you will be able to conceal the unattractive plumbing for gas jets and to create the illusion of an open, free floating fire. It is also the safer and much more beautiful alternative to old fashioned rocks and fake logs traditionally used in gas fireplaces. An outdoor fire glass pit creates patio or deck lighting that is a centerpiece and radiates enough heat to keep guests cozy and warm even in cooler outdoor temperatures. A brilliant conversation piece, the reflective colors also soften the look of anyone sitting close to them adding a sensual spark to any gathering. Dazzling flames dancing on the colored glass is all that you or your guests can see. Perfectly safe for use in any fire space, it is also used in aquariums, Terrazzo flooring, mosaic cement counter tops, and landscaping. Typically, fire glass is sold in bags and can be purchased through online specialty vendors who offer an enormous array of styles and color combinations, but home improvement stores and fireplace shops also carry this innovative new product. Easy to keep clean, your glass can be washed periodically with mild detergent and warm water to retain clarity and sparkle for years. Fire glass fireplaces transform any room into a magical place of color and warmth, ready for relaxation and rest. There is no need to go to the expense of a remodel, when your new fire can be color coordinated to your home decor in a flash, changing the dynamics of the entire room. As bathrooms are being upgraded to become a place of relaxation with steam showers, designer faucets, and mirror TV screens, lighting and bathroom light fixtures are becoming more important. You can even find bathroom lighting consultants. You will have to know the different types of bathroom light fixtures and their different proposes. The most important thing to know about bathroom lighting is the correct placement of the fixtures and the kind of light it will emit. There are also some basic enhancements to know, which can make a bathroom feel bigger, cozier or more luxurious. There are many different types of bathroom light fixtures used for different purposes. Lighting in a bathroom can serve 3 different purposes: you have task, ambient and accent lighting. Task lighting is the most important form of lighting in a bathroom. It is for areas of the bathroom where a person will be performing a task such as grooming. 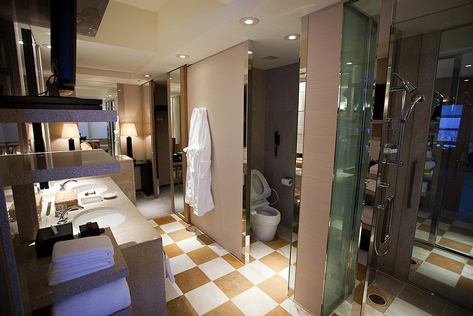 The main task areas of the bathroom are the mirror and the shower/bathing areas. Bathroom mirror lighting is also called vanity lighting. Vanity lighting needs to be the top priority for bathroom lighting design, as it needs to light the head properly for grooming. The common mistake with bathroom vanity lighting is to simply put a light right above the mirror, but this casts shadows on the face. The best way to setup vanity lighting would be to use the Hollywood effect, many white bulbs placed all around the mirror. This is more common back stage at fashion shows and in make up rooms than it is in bathrooms. A more stylish and practical option would be to use contemporary bathroom light fixtures: 2 vertical sconces, one on each side of the mirror and a horizontal sconce, aka a vanity strip, right above the mirror. This will create even lighting across the face. Sconces: Sconces are lights that are attached to the wall. They are narrow light fixtures, and can either be vertical (light shines out left and right) or horizontal sconces (light shines out top and bottom). Because of the need to clean, shave, see if it is slippery, and read bottles, the showering/bathing area is the second most important part to plan for lighting. In smaller bathrooms, the lighting from other parts of the bathroom might be enough to adequately light up these areas. By using modern bathroom lighting fixtures focusing on the showering and bathing areas will provide added comfort and style to the bathroom. The best kind of shower lighting ideas are shielded (this reduces glare) recessed downlights, which are listed for damp locations. An elegant light fixture above a bath would be a mini chandelier, or just a simple hanging light. Recessed Lights: These are lights that are installed into the ceiling. They provide softer light than fixtures that hang down from the ceiling and give the bathroom a modern look. 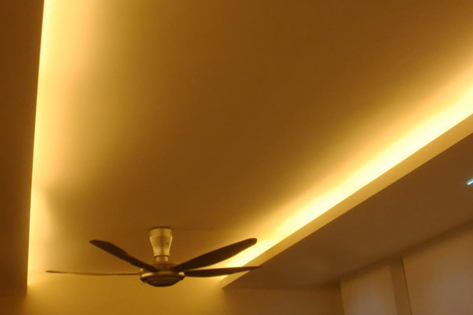 A false ceiling is usually installed to fit the lights into and hide the wiring. Downlights: Downlights, as the name suggests, are lights that can be angled downwards. 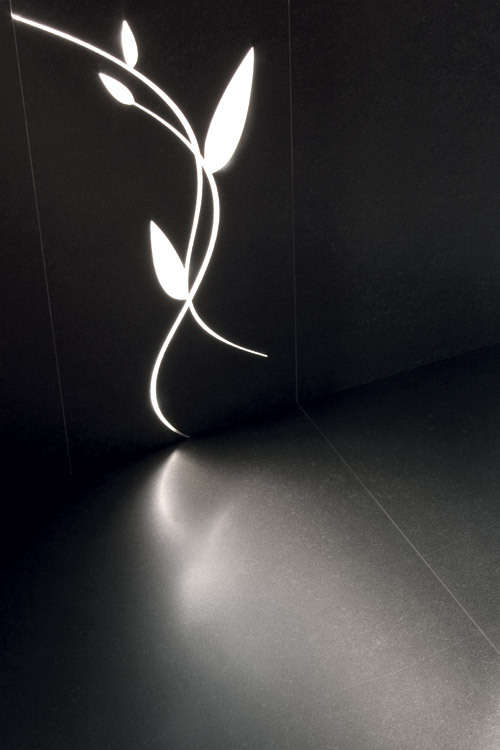 Usually recessed, these will shine light onto walls and surfaces below. only need one central ceiling light to light the rest of the room, while larger bathrooms will need multiple ceiling lights. Ambient ceiling lights are commonly recessed lights, or hanging ceiling lights. Wall washers and uplighters can be used to light up individual walls and the ceiling. 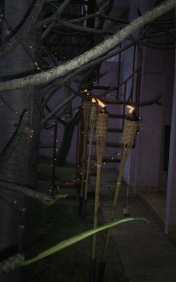 There are other creative options such as a rope lights or cove lighting. Wall washers: Just like sconces, wall washer are attached to walls but only emit light upwards, lighting up the wall above. Uplighters: these lights face upwards and light up the ceiling which then bounces back creating ambient lighting. A light colored ceiling works best with uplighters. Rope Lights: These are LED lights that come as a rope and extend out. They are versatile lights as they bend and come in a range of colors, and are more commonly used for landscape lighting. Cove Lighting: Cove lighting is when you add a ceiling that has cut away, rope lights are then hidden within the ceiling, adding a luxurious touch to the bathroom. A way of adding extra light (more the better) to a bathroom is to use accent lighting. Accent lighting is used to shine light on an object or area that you would like to highlight. It is usually in the form of smaller recessed lights, tilted to face artwork or a vase of flowers. 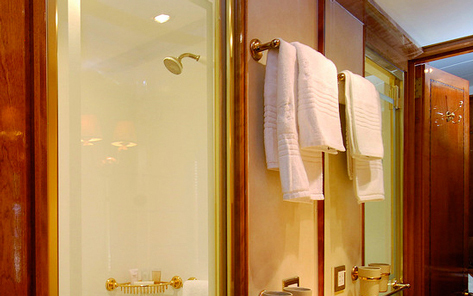 Highlighting such objects can greatly enhance the feel of a bathroom just like many 5 star hotels. There are a number of bathroom light fixture finishes and choosing from them will be based on what kind of look and style you want to give your bathroom. Chrome bathroom light fixtures are the most popular finishes. 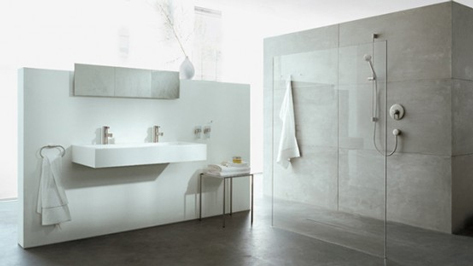 They provide a modern look and are easily incorporated into many bathroom styles. Other bathroom light fixture finishes include: bronze, nickel, rustic, and traditional. Look for fixtures that have translucent/frosted glass. This is so that the light can pass through easily but at the same time does not produce a glare, which is an issue with clear glass fixtures. When buying your bathroom light fixtures make sure to take into account that the glass of the light fixture can change the color of the light that is projected in the bathroom. In terms of safety, you will need to get the proper rated lights for the different areas of the bathroom. Areas that will get wet will need wet listed/rated light fixtures. If you are living in the UK you will need to know the different bathroom lighting zones and IP rating for lights. Once you have installed your bathroom light fixtures in the right layout, the next thing to do is to choose the light bulbs. A good rule of thumb to follow is to plan to have 300 watts of lighting for every 50sq feet. The best form of light is natural light. To maximize available natural light in the daytime is to frost your windows and then take down curtains and blinds. At the same time you don’t want to have too much exposed, as you will have the feeling of being on display. For vanity lighting, you want bulbs that best show off skin tones. These are: crisp white halogen light bulbs. Halogens provide the closest resemblance to bright daylight. Ambient and accent lighting: Soft warm colors, ones that give off that orange, natural, soothing daylight glow. The best light bulb would be warm florescent lights or incandescent. One quick and cheap enhancement recommended by lighting designers is to install a dimmer switch, which will let you have control over the level of lighting. Not only do dimmers save you money but they can make a light multipurpose: a dimmed light can provide ambient lighting (for candle lit baths), while a full light can provide task or accent lighting. With a few small changes to lighting, a bathroom can appear larger, taller or even cozier. Making a Bathroom Feel Larger:Generously light up the whole bathroom. Lighting up all four corners of the room gives a sense of space. If you have a light colored ceiling you can install wall washers to shine light on it. Also, mirrors with lights give the allusion of more space. Making a Bathroom Feel Taller: Two ways of making a bathroom feel like it is much taller is to use long vertical light fixtures and to also use low hanging pendant lighting. Making a Bathroom Feel Cozier: If you want to make a bathroom feel cozy then you need to do the opposite of making it feel larger. Try not to light the ceiling. Low lighting is better, such as table lamps. A bathroom lighting plan is made up of layers. The first stage of a lighting plan is to know the different purposes/layers of bathroom lighting: task, ambient and accent. The next stage of the planning process is to choose the right bathroom light fixtures (and finishes) and lay out where each light will go. You then just need to buy the right light bulbs to finish designing your bathroom. 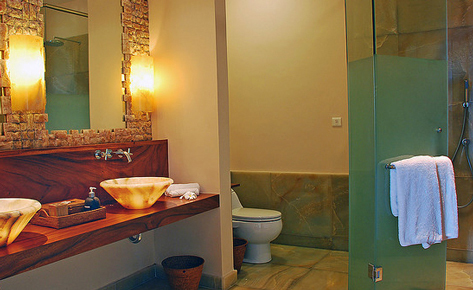 Bathroom lighting plays an important role, one that can decide the style and feel of a bathroom. Take a look at our bathroom lighting ideas photo gallery.